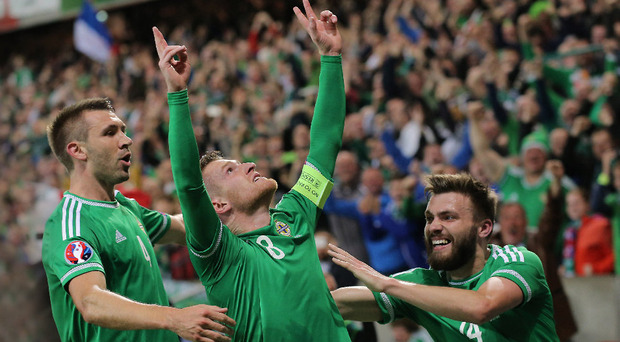 Northern Ireland captain Steven Davis celebrates. Northern Ireland have moved back up two places in the latest edition of the FIFA World Rankings. Michael O'Neill's side had dropped one place to 25th in last month's update but have now moved back up to 24th, above USA and Costa Rica. NI achieved an all-time high of 20th place before last year's World Cup play-off defeat to Switzerland and had since gradually slipped down the list. The latest move means Northern Ireland are now ranked seven places above the Republic of Ireland in 31st. Martin O'Neill's team remain unchanged in the latest FIFA release. England remain 16th, Wales stay 20th and Scotland drop to 32nd. Northern Ireland women are ranked 55th in the world, just two places off their all-time high of 53rd. An update on the women's rankings is due to be released next week.